Mandolins in Brisbane bring you autumn comforts for plucked string ensemble including works from Vivaldi to Kosma and everything in between. 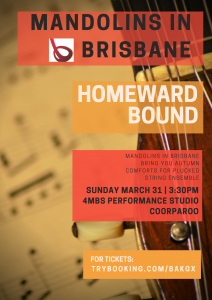 Sunday March 31 from 3:30pm, 4MBS Performance Studio, 384 Old Cleveland Rd, Coorparoo, QLD. The concert will include works and arrangements from Vivaldi, Kosma, Keen, Hatzidakis and will feature a range of favorites performed by Queensland’s premier plucked strings ensemble lead by their musical director Joel Woods. Pieces include popular songs such as “Autumn Leaves” and “Homeward Bound”. We hope to see you on Sunday afternoon, mando-lovers!